Fayette County Probate/Juvenile Court Judge David Bender swears in Mitchell Kirby and Mark Heiny at the Fayette County Board of DD organizational meeting. The Fayette County Board of Developmental Disabilities (FCBDD) held its annual organizational meeting recently to swear in Mitchell Kirby as a new board member and to re-appoint Mark Heiny for a second term of service. Kirby previously served on the board, but has not done so for two years, making him eligible for the appointment. Heiny begins his second four-year term and would be eligible for a third term in the future. Both were sworn in at the organizational meeting by Fayette County Probate/Juvenile Court Judge David Bender. It was also decided that Larry Mayer will continue as the board president, Janelle Mead will serve as vice president, and Alice Craig will serve as secretary. Other board members include Cody Kirkpatrick and David Sanders. The fundamental responsibility of the Board of DD is to represent the public in establishing policy by which the agency functions. In order to do so, all members of the board serve on several committees, including finance, programs, personnel, operations and ethics. 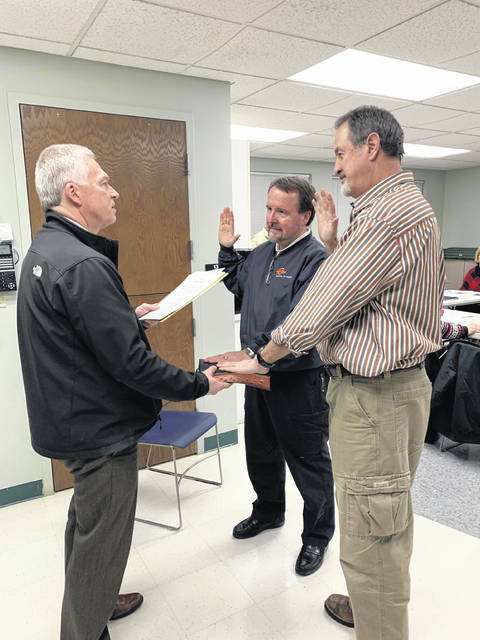 FCBDD meets the second Wednesday of each month at 5:30 p.m.
https://www.recordherald.com/wp-content/uploads/sites/27/2019/01/web1_1.jpgFayette County Probate/Juvenile Court Judge David Bender swears in Mitchell Kirby and Mark Heiny at the Fayette County Board of DD organizational meeting.